Custom made web belts featuring your own photos, text or design. Add your photos to design an innovative accessory. Our personalised webbing belts are completely customisable, create your own design and choose from two steel buckle finishes. Design your own belt by creating a repeating 10 cm pattern. A truly unique item personalised with your own photos. Our photo belts are practical and perfectly quirky. Custom made belts are not common - we are continuing to push the boundaries of the personalised product market. You can add your own photos to our personalised belts to carry your favourite photos and quotes around with you - with extra special style! Design both sides for an interchangeable belt. The interior design will appear upside down when on the inside, but right side up when worn. The belt came out great! Fantastic unusual and good quality product. Delivered so quickly. Will definitely use you guys again. Our personalised photo belts are made with top quality polyester webbing for ensured durability. Available in a metallic nickel finish flip buckle. With the option to design both sides, you can create a fully reversible belt, essentially providing you with two belts in one. The material for the webbing belt is supplied to us on a reel which we cut to size to order. 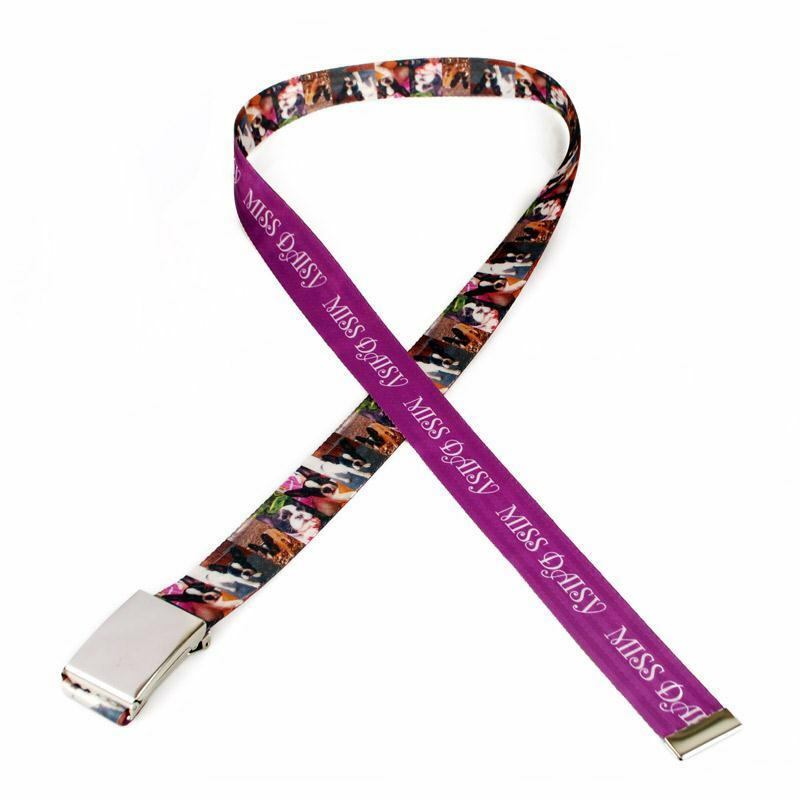 Your photos are then printed using a state of the art digital printing technique, which bonds the eco-friendly inks to the fabric of the belt itself. This means that there is no change in the handle of the material, it still feels exactly the same as it did before it was printed. Your design is long-lasting and in full glorious colour. Once this has been done our craftsmen will assemble your personalised belt, adding the buckle in your chosen colour. Everything is thoroughly checked to ensure that it is made to the high standard that we expect, before been shipped out directly to you. Custom made belts you design online. Upload your photos into our online design system and start to create your own belt today. Our website is easy to use and we are always quick on delivery. Design your own belt with pictures of family, pets, or your favourite quotes for a necessary accessory that shouts out your personality. Create your belt online, for free, and see how creative you can be! We offer a free online preview of your belt's design before ordering. As always, we offer unbeatable production and delivery speeds thanks to our integrated London location. Make a personalised scarf printed with your text, photos or design. Thick and warm scarf you design.